Sheep in the Dales was the very first lampshade I ever made, over thirty years ago. I lived in Lancashire and spent most weekends with my two children in my mother's lovely house in the Yorkshire Dales. There I was inspired by the rolling hills, dry stone walls and Swaledale sheep of the northern countryside. This design, as with many of my other sheep designs, forms a panorama which continues all around the shade. So popular has this design been, that I have always kept one available for sale in my Gallery, as I make a new one each time one is sold. Although I can repeat designs from original drawings, no two lampshades are ever the same. 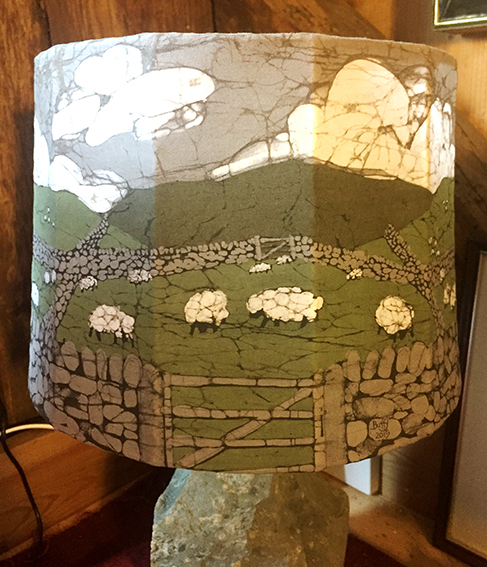 When my young daughter was once watching me work, I dripped wax on the white cloth by mistake when I was creating one of these lampshades, she said "Don't worry mum, just make it into another sheep" so I did!